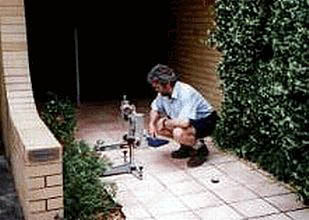 To measure the Slip Resistance of a floor surface in accordance with Australian Standards AS 3661.1 (1993), AS 4586 and AS 4663 (2004). A pendulum slip testing machine is used as pictured right. In this instance Brisbane City Council is testing a floor area treated with Slipsafe, this test was performed on behalf of Slipsafe at the request of the client. The results showed a pass in all areas with an average slip factor of .48, the Australian Standard requires a minimum of .40 to be considered a pass, in this instance we were well within the requirement. These tests are routinely performed by the various Councils and authorities in line with requests from Insurance Loss Adjusters in the event of a slip/fall claim or building supervisors to ensure compliance with Australian Standards and the applicable building codes. Please call our office for a no obligation, free site inspection and quote for serviced areas.